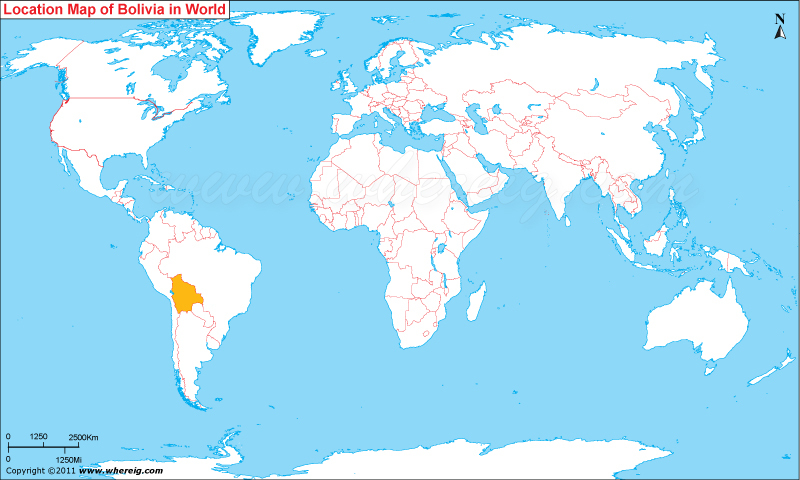 About Map: Map showing location of Bolivia in the World. As shown in the location map of Bolivia that Bolivia is located in the central west part of South America continent. As you can see on the Bolivia map that Bolivia is a landlocked country in South America that shares international boundaries from all sides. Brazil shares its boundary from the north and east, Paraguay and Argentina from south, and Chile and Peru from the west. The government type of Bolivia is a Democratic Republic, which is divided into nine departments. Bolivia's constitution is drafted very recently i.e. in the year 2006-07 and approved only in 2009. The newly constituted constitution provides balanced executive, legislative, judicial, and electoral powers in the country's governance. Surprisingly, country has two capital cities i.e. La Paz and Sucre. La Paz is the seat of government whereas Sucre is the constitutional capital. Geography of Bolivia is quite variable i.e. there are high peaks of the Andes in the West whereas there is lowland in the Eastern part. Due to this diversities and altitudinal differences, the weather system of the country also varies greatly. November to March, Bolivia experiences summer season; during these months, the weather is characteristically warmer but get wet due to rains. However, from April to October, Bolivia uses to have the winter season which is normally colder and drier. The ethnic groups of Bolivia are Mestizos, Amerindians, Europeans, Asians and Africans and the main language of the country is Spanish nevertheless, some of the native languages such as Aymara and Quechua are also being spoken by the native people. The main economic activities of Bolivia are agriculture, forestry, fishing, and mining. Besides, Bolivia also manufactures goods including textiles, clothing, refined metals, and refined petroleum. Bolivia has rich deposits of minerals, particularly tin.